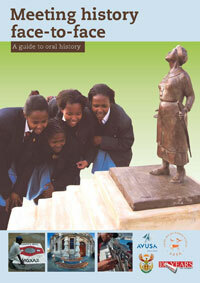 Commissioned by SAHA as part of the Sunday Times Heritage Project, Meeting history face-to-face: a guide to oral history showcases a ground-breaking oral history and memorial building project undertaken by schools in Bethal, Kroonstad and Polokwane in 2007. With input from participating students and teachers, the book and accompanying DVD uses this project as a mechanism to introduce oral history methodologies and assist secondary school students and teachers to prepare for the Nkosi Albert Luthuli annual oral history competition. Copies of the book and DVD have been distributed to schools and other educational organizations in 2008 and 2009 at a variety of events, including the finals of the Nkosi Albert Luthuli annual oral history competition. Available in print and PDF from SAHA. Meeting history face to face from South African History Archive on Vimeo.